Belgium is known for their harsh riding conditions and seasons, with riders demanding a lot from their equipment. Ridley is a Belgium-based company that has been designing their bikes around these conditions and sending them off to riders around the world. The Fenix SLX is a revamp of their Fenix SL, which was originally introduced as a rim brake frame for all-purpose riding. 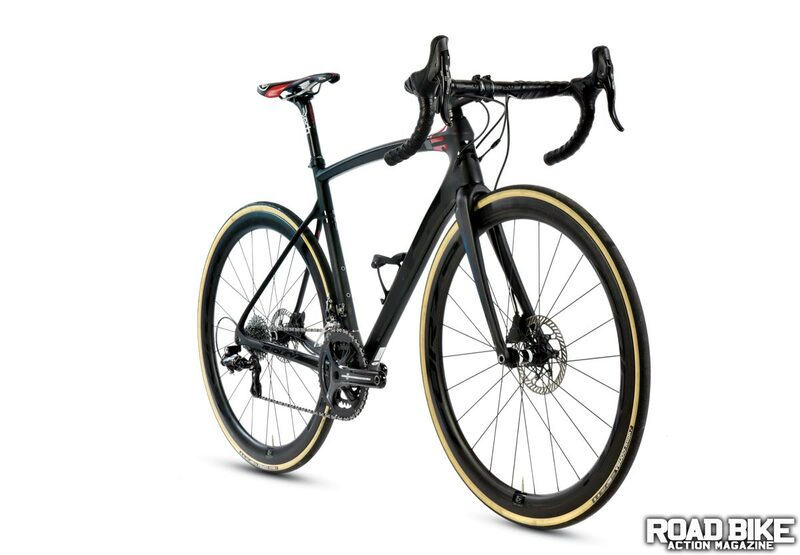 With a new set of disc brakes and a lighter frame, the Fenix SLX was created in hopes of being a go-to bike for riders looking to wander the mountains and back roads. The Fenix SLX was designed as an all-around endurance ride to coincide with the brand’s Noah aero bike and the Helium climbing bike. 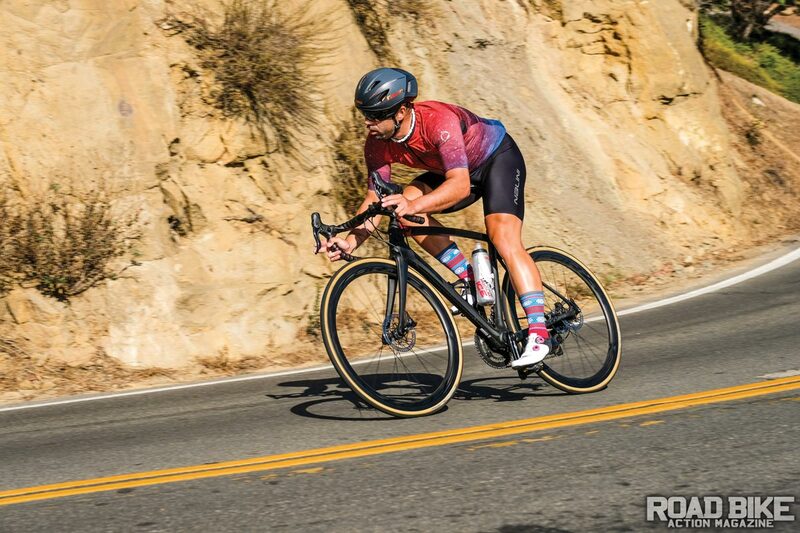 Ridley uses a more relaxed geometry when compared to their race oriented bikes, but with a slightly more aggressive edge in terms of stiffness and overbuilt tubing. The Fenix uses Ridley’s Diamond Shape tubing that gives the frame added stiffness and responsive pedaling. The Fenix uses several different levels of the carbon fiber, including 50- and 60-ton in different spots on the frame to find a balance of compliance and pedaling performance. While most of the frame tubing is oversized, the seat tube is slimmed down for a 27.2mm-diameter post, and the seat stays are thinned out to add to the vertical compliance. The frame has full internal cable routing, including slick routing for the front brake hose through the fork leg. Ridley designed the Fenix with front and rear 12mm thru-axles and flat-mount disc brakes with clearance to run up to 160mm rotors. With some rougher and adverse riding in mind, Ridley made room for riders to use tires as wide as 30mm. provided by Deda, including their aero-shaped Forza Cirrus handlebars. Love the shape and separate shifters of the Campy levers. 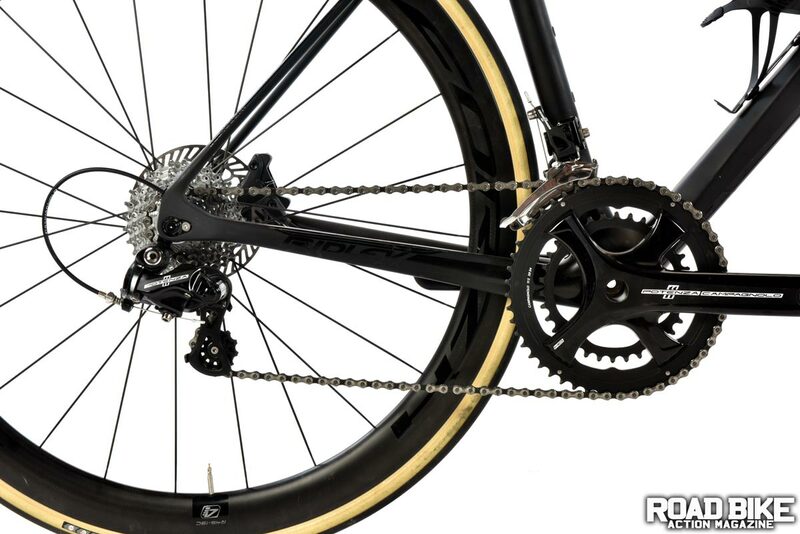 Campagnolo’s Potenza disc brakes offered a comfortable range of modulation and all the stopping power we needed under hard braking efforts or sudden changes in terrain. 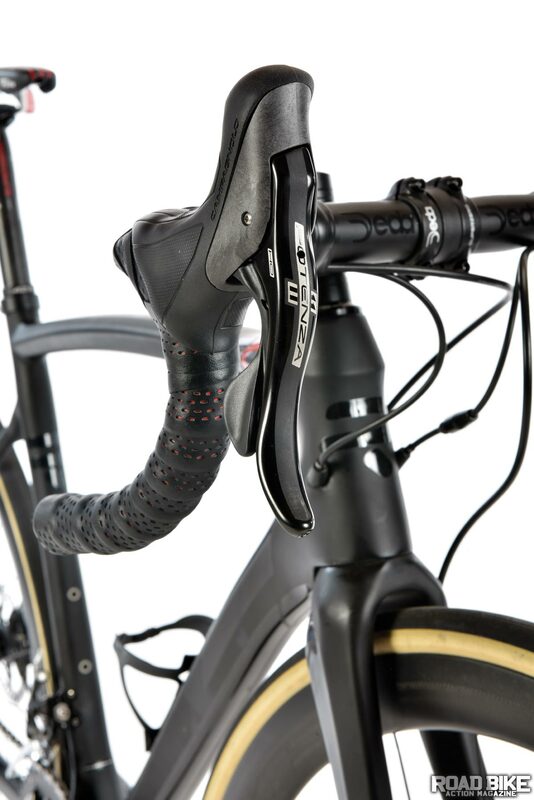 The shifter levers have the comfortable ergonomics that we would expect from Campy as well. During our testing we noticed that the shifting performance (rear upshifts specifically) wasn’t quite as quick as other drivetrains we have ridden, but the braking performance on the new Potenza group is superb. Most of our test riders found the reach to be comfortable and not overly stretched. While the top tube measures 54.5cm for a size small, the reach is on par with other mediums or 54cm bikes. Part of the Ridley’s ride quality is delivered by the small diameter tubes in the rear triangle. We liked the 12mm thru-axles and flat-mount brakes. During our first ride we were surprised at how snappy the Fenix was, boasting a very responsive ride. Out of the saddle the Fenix sprung to life, lunging forward in a lively fashion that took us by surprise with no lag or dead feeling from the ride quality. The overall frame stiffness did translate to a slightly rougher ride than we were expecting, especially on rougher sections of pavement. The Fenix proved to be an efficient climber with the stiff and responsive frame, but the overall weight of the build kit didn’t put this machine up as a mountain goat. While the climbs weren’t as quick as some of our test riders would have liked, we were rewarded with epic descents and stable handing at high speeds. The Campy Potenza disc brakes offered us all the modulation our test riders wanted and allowed us to carry good speed in and out of corners. The Fenix SLX is one seriously fun bike to whip down the mountain. Our test riders appreciated the stiffness of the frame overall, but felt that between the overbuilt tubes and burly handlebars, the front end would get overwhelmed at times. As a performance oriented endurance bike, the Ridley was one of the most well liked bikes we’ve tested. While the frame shape was deemed a winner by everyone who laid eyes on the bike, test riders had a mixed reaction to the all-black, murdered-out look of the Fenix, with some thinking it was too black and others thinking it was just right. Like a handful of other bike brands, Ridley, too, offers a custom-paint program where, if so desired, this same black-on-black bike could instead be had in a fluorescent green and orange mash-up! The Fenix SLX sits high up on the list of responsive bikes that we have tested and can rip down any mountain confidently. 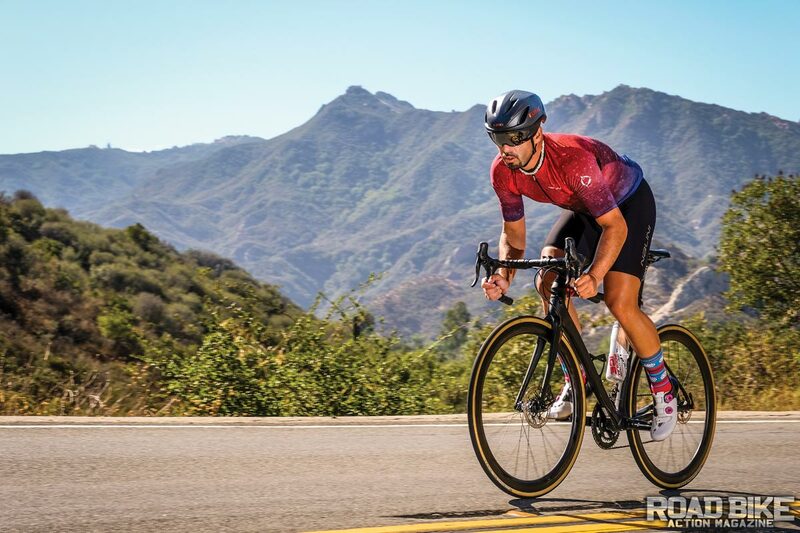 If you are looking for a bike with ultra-endurance comfort, the Fenix will be a touch too stiff compared to other bikes in that segment of cycling, but will appeal to the performance-oriented rider looking for something a little more relaxed than their usual race machine.